Integrity! This is one word that can pass as not being used often in our everyday vocabulary. It’s been replaced by words like “honest”, “truthful”, “earnest”. If you read books like, “The Fruit of Honesty”, or “The Importance of Being Earnest” in high school, then you might get that part. LOL! But the scarce use of this word doesn’t equal its non-existence neither does it take away from how important it is, especially for Christians, to practice and emulate this virtue. 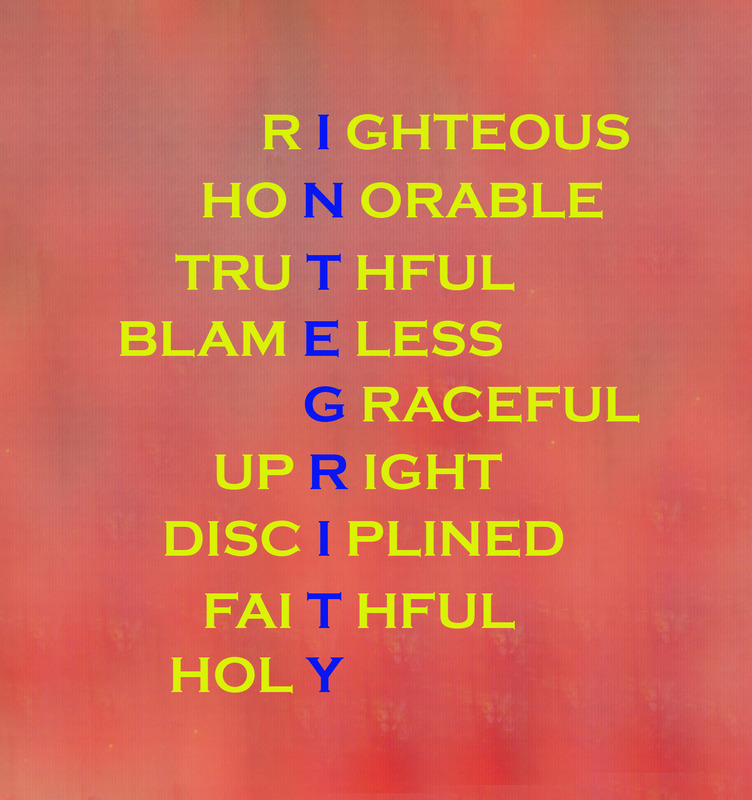 This article would be based on my personal story of how integrity brought me out of a situation that had the potential to mar my destiny but before I go on, I would like to define integrity so we can relate well to the story. The Merriam Webster’s dictionary defines integrity in summary as “the quality of being honest and fair” (remember one of the words up there). It goes on to define it as “the quality of being complete or undivided” and on the note of the latter definition is where I would like to begin my story. When I was in 10th grade (SSS 1), my younger brother had a female friend in 9th grade whom I had a liking for. She’s a petite, quiet and dark skinned girl so I liked her just as a younger friend. The time of this story was the last week of school after exams. Examination scripts were being assessed and students got their scores and were left alone to predict how good or bad their final results were going to be. One evening after school, I and my siblings were waiting for my mom to pick us up. This girl has two other siblings so we all decided to stay in the same classroom to wait together. (My mom is a teacher in that primary school, by the way, so we were waiting in her classroom). One thing led to another and we were all talking about our exam scores and how good (or bad) they were. Just to put in that I was a pretty smart student in high school and had a good potential of being a prefect in my final year (which is every high school student’s dream, LOL!). So, this girl just said that she saw one of my assessed exam scripts in one of the staff rooms. I demanded several times to know the score but she declined vehemently. In a twinkle of an eye, it became an exchange of angry words between the both of us which later turned physical! We stopped fighting and after a while, I, being at fault, decided to apologize. I went over to her after getting no response from calling her name a few times. I was so scared I was shaking! I sprinkled cold water on her face and she came around after a few minutes. I breathed a sigh of relief while apologizing to her but she shook herself away from me. Both our moms came in not long after that and we all went home. I was still very much afraid of the aftermath of what I had done which is where the moral of my story begins. Fast-forward to the next day in school, I was summoned to the Vice-Principal’s office. That was the first (and last) time I was summoned to someone’s office for bad behavior. The two flight of stairs to her office seemed like the Israelites’ journey. I was contemplating in my heart what to say, whether to deny all allegations or accept responsibilities for all my actions. I thank God I chose the latter. The Vice-Principal, together with the girl and her mom, was visibly angry and asked me what happened the day before. I explained EVERYTHING to them not hiding anything at all and apologized to both mother and daughter. The angry looks on their faces began to soften. The Vice-Principal began to recount how much she has vouched for my honesty before the lady (the girl’s mother) and she was glad I told the truth. She added that if I had lied, I would have been punished, not because of fighting with a vulnerable junior student, but because I denied it. The girl’s mother also confirmed that she was about to take some serious steps about that case but was softened by the fact that I took responsibilities for whatever I did to her daughter. I was truly sorry and appreciative to them both. I also visited the Principal’s office with my mom but I walked out of the gates of that school that day with no punishment whatsoever (although my parents gave me their own dose of punishments and whooping when I got home 😉. My dad actually made me fast and pray for the next three days. LOL!). I would just like to add that I am not proud of this story, not because of my Dad’s whooping, but because I didn’t set a good example for those young kids watching me fight that day, but I can boldly say it now because of the sweet grace that Jesus gave me to start all over again. At this point, I believe I don’t need to point out the moral of this story, it speaks for itself. The power and importance of integrity cannot be overemphasized. In a world and society where many things are done through crooked means, we as Christians should stand our ground, be a light in the darkness and stand only for the truth no matter how long the journey might be. Say what you mean and mean what you say! “But Joseph refused. “Look,” he told her, “my master trusts me with everything in his entire household. No one here has more authority than I do. He has held back nothing from me except you, because you are his wife. How could I do such a wicked thing? It would be a great sin against God.” (NLT). Joseph loved and God and feared him enough to know God’s likes and dislikes. He chose to obey this God that he loved so much and damn the consequences. When you love the Lord with all of your heart, you love what he loves and hates what he hates. That’s why sin begins to irritate you. Pray that God pours out his love into you afresh. If you look further into the story of Joseph, his road to success was very long but he chose to obey God which resulted in a long road of finally fulfilling destiny instead of cutting his glorious destiny short with a little dose of temporary “enjoyment”. Being dishonest or corrupt is never the way because ONLY truth stands. The Bible says this in Proverbs 10:9 “People with integrity will walk safely, but those who follow crooked paths will be exposed” (NLT). As I round up on this article, I am led to digress a little to connect to those who can relate on a personal level to my story, those who might have done something they are not proud of in the past and don’t seem to forgive themselves even when they know that God has forgiven them. The Lord wants you to know that he has made your wrongs right on the cross. He has totally paid the price of all your sins, past and future included, and he loves you so dearly for who you are. Always pray against guilt because it is not a spirit that comes from God, make restitutions if needed and live a life free of guilt, fear, and sin. Thank you for reading and I hope I did not bore you. You can also share your experiences with me in the comments below. Great! Thank God for His mercies. He took control of everything to His glory alone. You forgot to add that when you got home and I asked you how it all happened. That you told me exactly as it happened which made to comment that though you were wrong, I commended your honesty. Baby girl I am still proud of you today just as I was proud of your honesty that day (though I disapproved of your fighting). Keep it up girl. God bless you. Great! I am proud of you girl. Thank God for His mercies. He took control of everything to His glory alone. Keep it up. The Lord will continue to strengthen you, Amen. You are welcome MOD. God bless you and all that are your’s in Jesus Name.